The atlas moth (Atticus Atlas) is one of the Earth's largest moths. Although it doesn't have the largest wingspan of all the moths, it does have wings with the largest surface area. Atlas moths have a wingspan that ranges from 8-12 inches (20-31 cm) and a rather large and fat body. The name "Atlas Moth" is derived from the pattern on its wings. Its wing pattern is said to resemble a map. Atlas moths belong to the family Saturniidae, which includes many other large moth species (e.g., luna moths, crecropia moths, Io moths, and many others). One interesting fact about all moths from the family Saturniidae is that they do all of their eating during their larval stage. The adult moths don't feed or even have functional mouths. The main purpose of the adult stage of Saturniidae moths is to reproduce. Perhaps this is why their bodies are so large. Since they don't feed in the adult stage, maybe they need an extra large body to hold everything they are going to need for reproduction. Of course they also need large wings in order to lift and fly their large bodies around. According to the literature, this moth is only found in Southeast Asia (e.g., India, China, Indonesia) and you won't find the atlas moth in North or South America. However, I've received emails from 2 different people who have photographed this moth in South and North America - One in Ecuador and the other in Virginia. The female atlas moth lays brownish looking eggs that are typically laid in clusters on the underside of a leaf of a host plant. 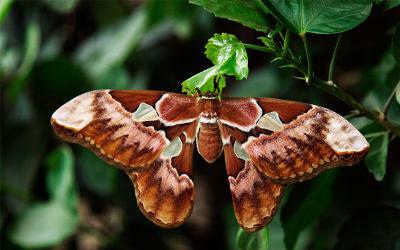 The atlas moth can use several different host plants. If you are trying to raise these moths in captivity they can be fed willow, poplar, or privet leaves (Carter, 1992). In about ten days the eggs hatch and out come little greenish caterpillars that feed on the host plants. They grow and molt for about a month and a half until they form a brownish, silken cocoon. The moth remains in the cocoon for about six weeks while it undergoes metamorphosis. 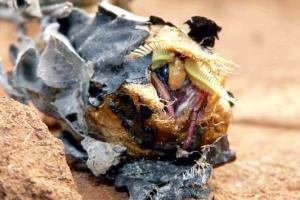 Then it emerges as an adult moth as seen in the photo below of an atlas moth emerging from its cocoon. 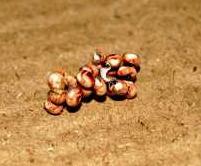 The adult stage only lasts a short time (about 10-14 days) - just long enough to mate and lay eggs. As mentioned earlier, the purpose of the adult stage is for the moth to reproduce. The adult moth is nocturnal. Once the female atlas moth is out of the cocoon, she pumps fluid into her wings and then waits for them to expand and harden. At dusk she releases a pheromone that the male detects using his feathery antennae. They mate and the atlas moth life cycle begins again. Carter, D. (1992). Butterflies and Moths. London: Dorling Kindersley. Copyright © 2008-2018 ButterfliesSite.com. All rights reserved. Image of atlas moth © Johan Spaedtke from Wikimedia Commons The following three images are licensed under the GNU Free Documentation License Version 1.2 or greater. Image of atlas moth emerging from cocoon © Sachin Palkar from Wikimedia Commons.